Practice Safe DNS — a social and educational hub where Internet heavyweights Vint Cerf of Google (the “Father” of the Internet), Steve Crocker of Shinkuro, Inc. (Internet pioneer), Jim Galvin of Afilias (DNSSEC expert), Dan Kaminsky of Recursion (discoverer of the “Kaminsky Bug”), Cricket Liu, VP of Architecture at Infoblox (and co-author of “DNS and BIND”), and Ram Mohan of Afilias (pioneer in Internet security) speak via video testimonials and blogs about the threats lurking in the Internet’s infrastructure and how to best combat them. 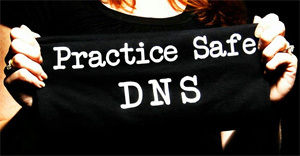 (www.practicesafedns.org)With the goal of promoting security and curbing growing abuse of the Domain Name Systems (DNS), .ORG, The Public Interest Registry is launching the "Practice Safe DNS” campaign — a new initiative that will serve as a key resource for domain holders, registrars, web developers and IT professionals to learn how they can respectively play a increasingly relevant role in providing a safer and more secure Internet. .ORG, The Public Interest Registry has long-stood as a leader in Internet security by promoting and implementing best practices against attacks such as pharming, cache poisoning, DNS redirection, and domain hijacking. Steve Crocker, CEO of Shinkuro, Inc., added: "The first domain name may have been created 25 years ago, but the Internet is still in its infancy when it comes to security. By sharing our experiences, we hope to educate and disseminate the importance of securing the DNS and illustrate how each of us — whether we are registries, registrars or registrants — play a vital role in obtaining complete Internet security." Earlier this summer, .ORG — with Afilias as its registry service provider — became the first generic top-level domain to offer full DNSSEC deployment and sign second-level delegations. Shortly thereafter, .ORG announced the insertion of its DNSSEC key into the Internet root zone, followed by an announcement that three major registrars, GoDaddy, DynDNS and NamesBeyond, have added an extra layer of security for all .ORG domain name holders by adopting DNSSEC. Additional details on .ORG's commitment to Internet security can be found at http://pir.org/why/security. Local Time: Friday, April 19, 2019 02:12 PM PDT – Page Load: 0.3996 Sec.